Canola oil, otherwise known as rapeseed oil and derived from rapeseed plants, is a staple in many pantries and often used in cooking and baking. You might be wondering what canola oil is really made from, especially if you're consuming it regularly. Knowing the chemical formula of canola oil helps you better understand what you're putting in your body. Therefore, these three elements are the main building blocks of canola oil. According to Portland State University, the main fatty acids present in canola oil are as follows. 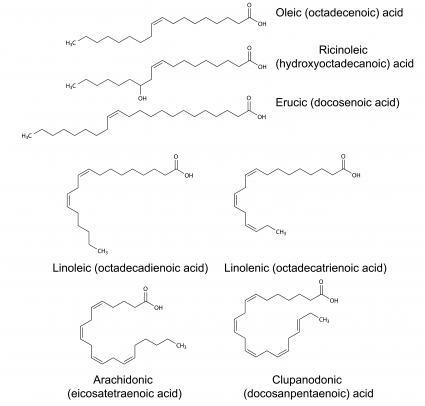 Palmitic Acid (C16H32O2): 4% of canola oil - Because palmitic acid is a saturated fat, it's thought to boost chronic disease risks (like heart disease and cancer) when eaten in excess. However, one 2013 review found that palmitic acid and other saturated fats may not be as bad for your health as once thought. Stearic Acid (C18H36O2): 2% of canola oil - Stearic acid is a saturated fat that can promote inflammation, according to one 2010 study. Therefore, it's generally best to consume this fatty acid in moderation. Fortunately, it only makes up about 2 percent of fatty acids in canola oil. Oleic Acid (C18H34O2): 56% of canola oil - Oleic acid is one of the most abundant fats in nature, according to PubChem. One 2008 study found oleic acid appears to help lower blood pressure. Linoleic Acid (C18H32O2): 26% of canola oil - This polyunsaturated fatty acid supports heart health, especially when used in place of saturated fat and carbohydrates, according to Harvard School of Public Health. Alpha-Linolenic Acid (C18H30O2): 10 % of canola oil - This essential omega-3 fatty acid is beneficial for a healthy heart, appears to help prevent your risk for chronic diseases, and is a must for proper brain health. 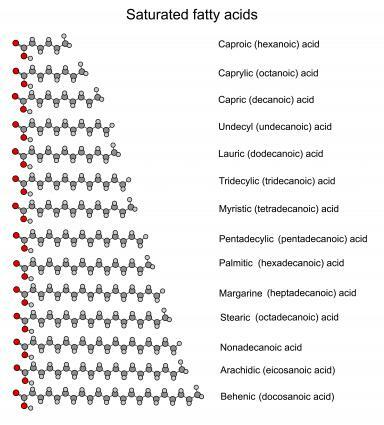 Each of the main five fatty acids that make up canola oil has a different chemical makeup, but all contain various combinations of carbon, hydrogen, and oxygen - and most are beneficial for your health. Adding canola oil to your meal plan provides you with some health benefits, especially when used in place of saturated fat, trans fat, and refined carbohydrates. 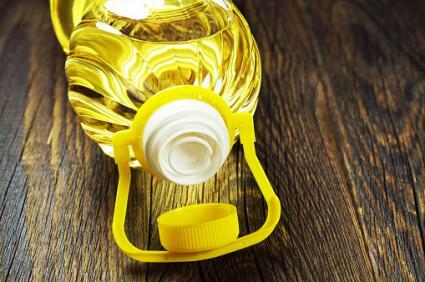 This is because the majority of canola oil is made up of the heart-healthy unsaturated fatty acids oleic acid, linoleic acid, and alpha-linolenic acid.